Alesco on a visit to Marigot Ltd’s Icelandic plant - Alesco S.r.l. Lithothamnion Calcareum, derived from calcified seaweed from the seabed in Iceland, the most naturally occurring source of calcium and magnesium. For 10 years, Alesco has partnered with Marigot, an Irish company that produces Aquamin®, an ingredient derived from calcified seaweed (Lithothanium Calcareum) deposited on the seabed of very few (and remote) parts of the world. These areas are specific due to their water temperature, amount of light and a certain water depth and purity. 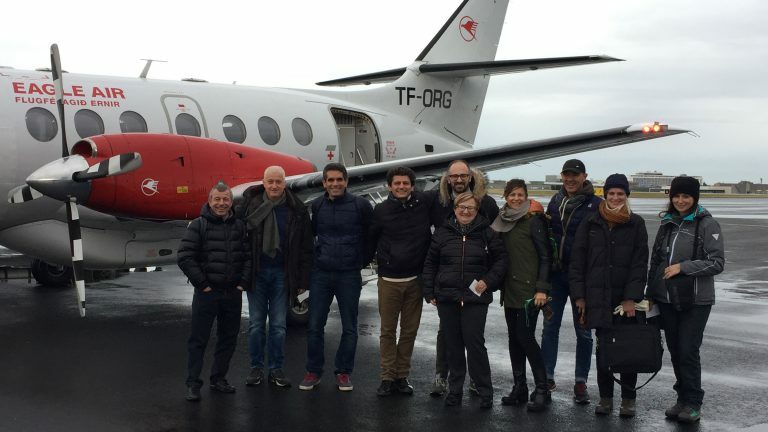 On the 10th anniversary of this partnership, we invited our best customers to visit the Marigot collection plant in Iceland, at Bíldudalur (in Arnarfjörður), to show them, in addition to the entirely specific nature of the extracted product, as well as our partner’s attention and care in conserving the marine environment in which Lithothanium Calcareum is found. Aquamin®, a plant source of calcium and magnesium, is derived from a certified seaweed that, having ended its life cycle, separates from the living part and is deposited on the seabed due to currents of very cold and highly purified waters. It is no coincidence that the only areas in which this seaweed is found are in Iceland – which has always been strictly careful in conserving the ecosystem in which it is found – Ireland and, to a lesser extent, Normandy. Our partner Marigot has plants in Iceland and Ireland in which, especially in the former, the collection process is initiated, using highly sophisticated dredgers and specifically designed not to damage the entire seabed. This is then followed by a washing phase, a sieving phase and a drying phase, before being transported to Great Britain where, as regards the food industry, the processed seaweed is sterilised and finally micronised before packaging. The final product obtained is used as a source of calcium and magnesium and also contains 74 traces of other minerals which help facilitate the absorption of the two main minerals. We use Aquamin on behalf of major manufacturers of beverage alternatives to cow’s milk (rice milk, soya milk, almond milk, etc.). This is because the manufacturers of these types of beverages tend to follow the sustainability logic and need a calcium and magnesium supplement in the beverages they market. Another specific aspect of Marigot’s operations, which fits in perfectly with the needs of our customers, is precisely the sustainability of the entire extraction and manufacturing process for which it has an exclusive thirty-year licence issued by the Icelandic Government.The collection procedures, in fact, concern sedimented and calcified material, therefore the live algae on the seabed is not affected. Secondly, Marigot is required to follow strict guidelines to protect the environment in which it works, which involves a precise definition of the extraction areas and of the amounts extracted, as well as report and schedule of all works, in close partnership with the Marine Research Institute (MRI) – Hafrannsóknastofnunin. Thirdly, almost all of Marigot’s facilities function through geothermal energy and hydroelectric power. Finally, not least due to proven accuracy, it seems, according to ongoing studies that the process of lowering of the seabed caused by the collection of sediment allows the new algal vegetation to grow back where it previously no longer grew. The fact that human activity, conducted by Marigot with sustainable regulations and logic, may not only not cause damage but even, to a small degree, help to improve the environment it affects, makes us feel proud to have them as our partner and further reassures us regarding our commercial choices, which have always been in search of completely natural ingredients. The visit to the plants greatly surprised and satisfied both us and our guests, partly due to the fantastic setting and unspoiled landscapes, as well as the breathtaking Westfjords.